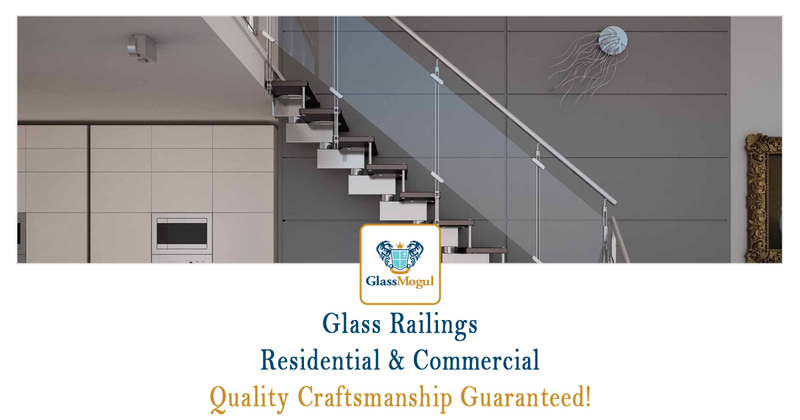 At GlassMogul we service, repair, install, and replace glass railings that come in all shapes and sizes for both residential and commercial applications. Our glass stair banisters and handrails are perfect for a modern look in your home or office. Our railing systems are designed for both interior and exterior use and work perfectly as a room divider or protective railing for your porch, patio, or deck. We have a great deal of experience in installing aluminum, stainless steel, and wood railings. Furthermore, we’ll get the job done correctly, before the deadline, and within budget. We install and repair Arcat, C.R. Laurence Co., EZ Handrail, Global Glass Railings, Livers Bronze, and Peak Aluminum Railing glass railing systems to name a few. We perform work on all brands and styles, regardless of how old they are. When it comes to installing new glass railings, we offer aluminum, clear, commercial, deck, exterior, frameless, frosted, home, interior, office, patio, picket, residential, stainless steel, stair, tempered glass, and textured glass systems.